You can help save chimpanzees simply by recycling your old phone. How do old phones help chimpanzees? The mining of coltan poses a substantial threat to African great apes. Coltan is a mineral used in electronics. Mining results in the clearing of habitat in coltan-rich areas such as the Democratic Republic of Congo (DRC) where chimpanzees live. It also drives the bush meat trade, further exacerbating the decline of chimpanzee populations. The Jane Goodall Institute Australia (JGIA) and our mobile phone recycling partners are committed to raising awareness about the protection of great apes. We aim to reduce the impact of mining on great apes by removing mobile phones from the waste stream by remarking them for reuse or breaking them down for recycling. Phone refurbishment helps to reduce the demand for coltan mining in critical chimpanzee and gorilla habitat. Phones that cannot be reused are broken down into their constituent parts and recycled. 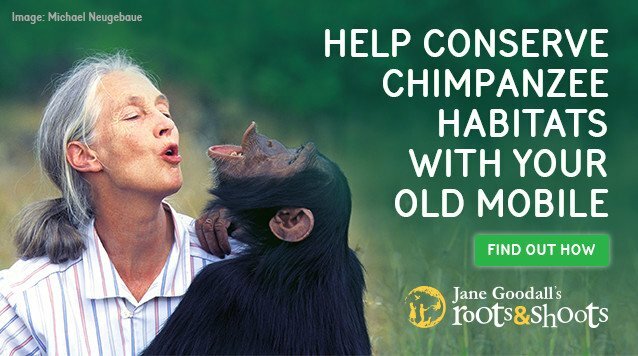 When you donate your old phone, our generous mobile phone recycling partners donate money to The Jane Goodall Institute Australia on your behalf. This money then goes towards our conservation programs in the DRC. All phones donated will either be refurbished and resold by PhoneCycle, or dismantled and recycled by Mobile Muster, the only not for profit Government accredited mobile phone recycling program. These organisations will then donate the money raised to JGIA, which we use to support the work of Jane Goodall by funding our conservation programs in Africa. All Australian primary and secondary schools are eligible to register using our sign-up page. Following registration, schools will receive a digital resource kit which includes information on how to setup your collection station, how to organise a visit from one of The Jane Goodall Institute Australia’s Roots & Shoots team, as well as promotional material and education resources.